In a time when God's people were in shambles physically and spiritually, he promises judgment — judgment on them and their oppressors. But he also reveals why. He will show his greatness and holiness so they will know him, YAHWEH — God of "his people" and also of all nations. I would love for God to show his greatness and holiness in our day; wouldn't you? To have God honored for who he is and what he has done would be marvelous. May that day come quickly. Father, as your flawed and mortal child, I do fear your bold revelation of yourself. We humans are mortal and frail in comparison to your blazing glory. But I have confidence in my relationship with you through Jesus, and dear Father, I want you honored and your name revered in my day. I am tired of hearing your name used in vain and your glory profaned. 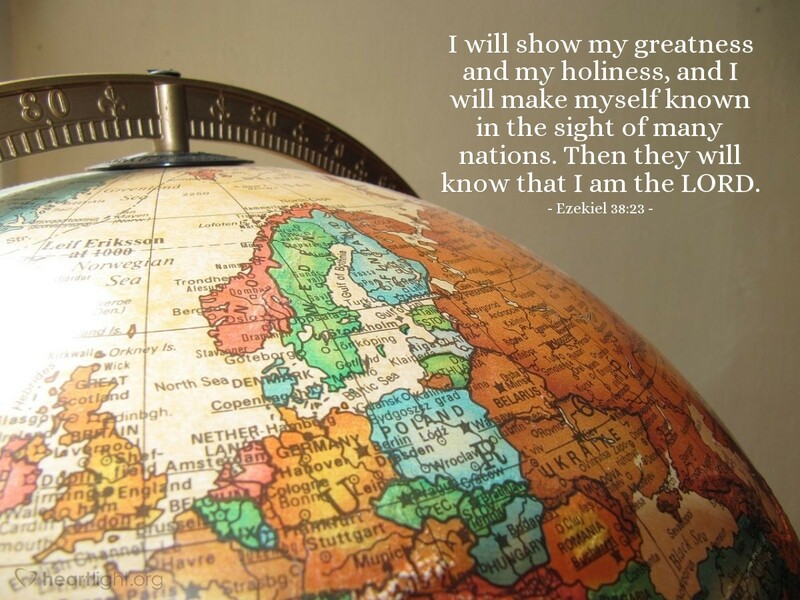 Exalt yourself before the nations! Reveal your holy majesty so that everyone will know that you are the only true and living God! In Jesus' name I pray. Amen.